No, this is not related to anything written by Jorge Luis Borges, but it is related to both dictionaries and labyrinths anyhow. Although there are hard-line extremists who advocate using only the target language when studying languages, I think most people agree that using knowledge from one’s native language is good or indeed necessary. When I started studying Chinese, if I encountered a word I didn’t know what it meant, I looked it up in a Chinese-English dictionary. Anything else would have meant hours of work and, in the long run, madness. Of course, this comes with it’s own problems, since the words in Chinese and English overlap only to a certain degree (much, much less than between Swedish, English or French for instance), but it’s often good enough, at least for understanding. Chinese-English dictionaries are also problematic, because they are seldom accurate enough to be reliable. Using a dictionary in a language you know is like using a bad map, which will allow you to find your way around, but will occasionally lead you astray. This is acceptable as long as merely arriving at the destination is our goal. Sooner or later, however, every student needs to start using a native dictionary. I almost never use English-Swedish dictionaries (I do sometimes for plants and animals) and I don’t need to, because I understand 99,9% of all definitions in a normal English-English dictionary. That’s not true in Chinese, but after becoming proficient enough in Chinese to read authentic texts, I started to shift from Chinese-English to Chinese-Chinese dictionaries. 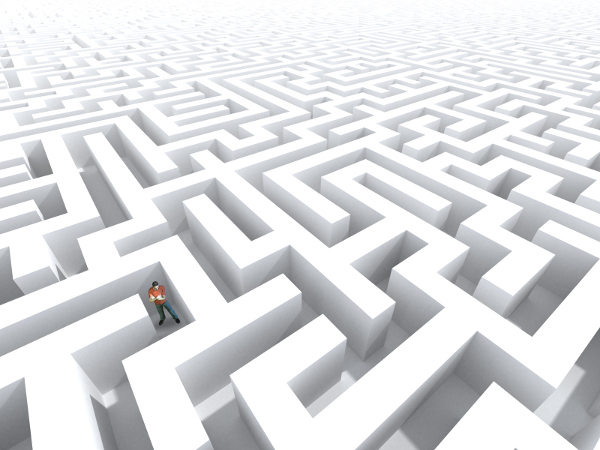 I think that this situation can be much likened to entering a labyrinths, trying to explore and map unknown territories. This a post about this adventure and also a guide to how to survive in these convoluted corridors. The first time I used a Chinese dictionary, I gave up immediately. Even explanations of simple words I knew well contained many words and characters I had never even seen before. In other words, I stepped into the labyrinth and saw the path ahead of me fork off in more directions than I could count. Picking one at random, I found that the next intersection was equally unfamiliar. However long I walked in this labyrinth, I would never reach the middle and I would never return to the position where I started. The few points in the maze I knew (words I had studied) were close to useless, because they were too sparse and not connected. This is why I think it’s a waste of time to try to learn Chinese in Chinese for a beginner; you need at least a rough map to refer to in order to survive. However, I’ve kept eyeing the labyrinth sideways, when it isn’t looking and won’t bite, and I’ve found some things out that make it more interesting. I have tried to enter it many times, using different approaches. After a while, I become well enough equipped to enter it properly and survive in it’s winding corridors. I don’t mean to say that either of these entries are extremely hard, but there is a considerable difference in required reading ability between these two dictionaries. To start with, the Merriam-Webster entry contains 38 different words and the Longman only 26. To understand the first entry, you need to already master words such as “intricate”, “blind alley”, “maze”, “tortuous”, “intricacy”, “perplexity” and “membranous”, whereas the second entry require a lot less. An interesting point here is that many of the words I just listed are considerably more difficult than the word we are currently looking up. Thus, before you even think about entering the labyrinth, try to find out something about it, preferably by asking an advanced learner or a native speaker who can easily judge which dictionary is the most suitable for you (links to online dictionaries are included at the end). I would never ever recommend Merriam-Webster to a beginner (or even fairly advanced students), because the Longman dictionary is good enough for almost all situations. However, sometimes Merriam-Webster is a lot more complete and accurate, making it the preferred choice. It all depends on what knowledge and tools you carry with you into the labyrinth. This is what we’re going to talk about now. A broad vocabulary of around 9000 words. This enabled me to piece together most sentences and identify the words I didn’t know. Without basic vocabulary, finding you way will be like entering a normal maze blindfolded. Knowledge of a high number of individual characters. I went through the 3000 most common Chinese characters before starting. This turned out to be incredibly useful since I usually only need to combine things I know rather than learn something completely from scratch. I have an electronic dictionary or smart phone app which allows me to just tap a screen to go to the next intersection in the labyrinth. Using a browser-based dictionary is a good substitute, but it’s very practical to have a physical device. I don’t mean to say that you have to have so and so many words, I’m just saying that’s where I started and I still found it quite difficult to only use Chinese-Chinese dictionaries even if I got the point most of the time. I have a hard time understanding those teachers who recommend using Chinese-Chinese dictionaries from the start (or from an intermediate level). Yes, it’s possible to cheat and there are short-cuts. You can study some basic labyrinth architecture, bring your shoddy, native-language map, you can skip some corridors that end up in places you’ve already been and you can try to avoid the less trodden parts of the labyrinth. There are many words which are commonly used in dictionaries but not otherwise, such as “signify”, “indicate”, “describe”, “contrast” and so on. Make sure you take time to learn these words, because they occur so frequently that you can’t really hope to survive without them. In Chinese, it’s sometimes hard because the words also exist in contracted forms (i.e. using only one character instead of two). Decide that after a number of intersections, you escape to a Chinese-English dictionary instead. This means that if you look up a word, you always try to understand that entry in the dictionary in Chinese, but if there are words in that entry that you don’t understand, you look them up in your native tongue. Or you go one step further and only do that for words you don’t understand in the definition of the definition. Skip parallel paths when you encounter them, i.e. don’t learn too many near-synonyms. In the labyrinth, they are only similar paths leading to roughly the same location. You will need to explore these parallel paths later, but if you’re trying to find your way around, don’t bother with them. If you know the component parts of these words, you will often enough be able to guess their meaning. Avoid straying off the illuminated paths in the labyrinth. If you’re using a fairly advanced dictionary, you might leave the more commonly used parts of the language and enter the more dangerous areas where few people go and hideous monsters abound. Here there be Thesauruses! Don’t be stubborn. If you’ve decided to follow advice one above, it’s okay to stop if you peer into a dark corridor and two yellow eyes the size of your fists stare back at you. Entering the labyrinth with the goal to map everything (i.e. not heeding any of the above advice ) is probably stupid and definitely impossible. A language is simply too big to ever grasp fully (you don’t mean to say that you know everything about your native language, do you?). How you choose to limit exploration is up to you, though. Name two words and see if you can find a path between the two words. If you pick to very different words, it will be quite hard, but this can of course be made easier by choosing related words. See how long it will take you to follow the definitions of a certain word until you arrive at an intersection where you know all the paths (i.e., keep looking up words until you find a definition you fully understand without having to look anything up). I sometimes just walk randomly, noting down words I find interesting and skipping the rest. This is probably not very good from a learning perspective, but you do stumble upon pretty cool words sometimes. During these adventures, it’s up to you how detailed a map you want to draw. Sometimes, I’m currently recording almost every unknown passage and intersection, storing and reviewing everything with Anki, but sometimes I only jot down the most important words and skip all near-synonyms or words I can guess. If you encounter words more than once on separate journeys, it’s usually a good idea to look them up. This is one indication of frequency. Most dictionaries won’t tell you how commonly used a word is (links to online dictionaries are included at the end). So, what do you choose, using a badly drawn and inaccurate map, or entering a strange and perhaps dangerous labyrinth, trying to understand how it works? I think that the answer depends much on how much you have studied (i.e. how strange the labyrinth is) and what your goal is. If you’re short of time, running around in labyrinths all day isn’t a good idea, although you might have to do that sooner or later anyway. If you’re happy as long as you learn Chinese, strolling in the labyrinth is excellent. I personally prefer to have a rough map that contains errors, but lets me find my way to whatever place I’m going, rather than using native dictionaries and not understanding very well what the definitions mean. Neither of these situations is ideal, but for my three couple of years studying Chinese, the rough map was a formidable guide. Still, however much one tries, this kind of map can never be accurate enough, one has to switch to native maps sooner or later. What dictionaries do you use? Do you know of beginner-friendly Chinese-Chinese dictionaries? Do you have any additional tips or tricks to share? There are many dictionaries to choose from and some of them use the same definitions. I’ve included these in the order I find them useful. There are a multitude of hardware dictionaries, too (such as those for electronic devices, which I’ve found to contain easier definitions) or printed editions (which I haven’t included). If you know of more, useful dictionaries, please leave a comment! I would especially interested in easier dictionaries. Yeah, that’s a good idea. I’ll get right on that one. Not exactly a dictionary, but an interesting take on this approach was Joel Bellassen’s 《说字解词》 published by 北京大学出版社(Beijing University). At the start of the book, a list of the 200 most common characters is provided, then a list of the 400 most common and finally a list of 900. Definitions of words in the dictionary are provided using only characters from each of those lists. You can see that the limited number of characters available to use for the definition makes them a little tortuous at times, but the point is that the student is using Chinese to understand Chinese. There are children’s Chinese-Chinese dictionaries are are much more pleasant to use and have lots of illustrations and clues that make things more helpful. Since I am in Taiwan it is easy to get these resource and to start with materials for an elementary first grader and a work up. Actually, this approach can be both fun and productive. It just might be that adult dictionaries are for people that have 12 years of education. I’ll never get 12 years of formal Chinese education. I wish dictionaries gave more example sentences, classified characters as 褒义词，中性词，贬义词，listed opposites together, linked verbs and nouns together, and described what the word represents to a native speaker. I am a beginner, and I basically use two tools to look up Chinese words, both of them on my phone: To look up the Chinese translation for an English word, or to quickly check the tone of a Chinese word, I use Hanping Chinese Lite by Embermitre. Although this doesn’t offer the accuracy or thoroughness of a good paper dictionary, it is extremely easy to use and fully adequate for my current needs. If I encounter a Chinese word that I am not familiar with, I use the Google translation app, which lets me draw the character. At the moment, I only know about 100 radicals, so using a regular dictionary would be out of the question anyway. But considering how user-friendly the phone apps are, I do think that it will be quite some time before I would even consider using a more traditional dictionary, which currently seems extremely daunting.